The hand of a door is always determined from the outside of the opening. The outside is typically the hall, passageway or street side of a door. For a closet door, the outside is the room side of the door. For a communicating door, the outside is the side from which the hinges are not visible when the door is closed. 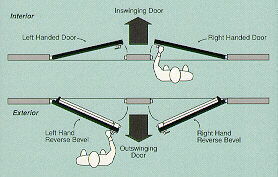 Inswinging doors - If the hinges are on the left side - the door swings in to the left - then the door is left handed - LH. If the hinges are on the right side - the door swings in to the right - then the door is right handed - RH. Outswinging doors - If the hinges are on the left side - the door swings out to the left - then the door is left hand reverse - LHR. If the hinges are on the right side - the door swings out to the right - then the door is right hand reverse - RHR. If you are describing handing for a pair of doors without a mullion, you can describe the handing of the door as either active or passive. For example, if you have a pair of inswinging doors and the door on the right (from the outside) has trim which is active and the door on the left has dummy trim, then the doors would be described as RH-active and LH-inactive. The same would apply to outswinging doors. Door closers, pivots and pivot sets are supplied as LH or RH only. The hand is determined from the push side of a door. The hand of a closer or pivot is the same as the hand of the door. When using a corner bracket, the hand of the closer changes to the hand opposite that of the door.